Marshall M. Fredericks Sculpture Museum | Sketches of "Victory Eagle (American Eagle)"
Although abstracted, the Victory Eagle appears to be landing on the surface of the pedestal. Moreover, it is situated above the eye-level of the viewer and looks down with glaring eyes. Its upraised wings, sharp beak, and talons add to its fierceness. 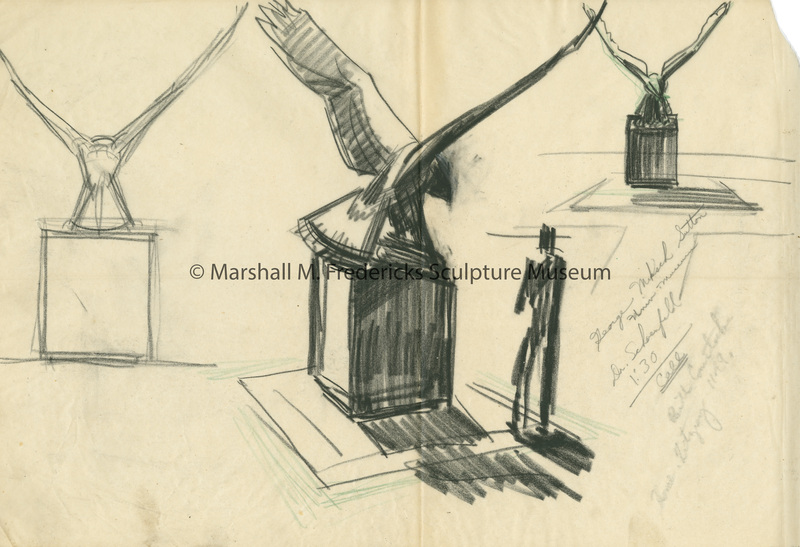 Fredericks, Marshall M., 1908-1998, “Sketches of "Victory Eagle (American Eagle)",” Marshall M. Fredericks Sculpture Museum, accessed April 21, 2019, http://omeka.svsu.edu/items/show/7660.